More on that in a moment. First, a little on my personal experience with WestJet vs Air Canada. The last time I flew with Air Canada, with a ticket booked well in advance of the actual flight, I was bumped from the flight because everyone who booked a ticket actually showed up--this is the real reason I was given by the gate attendant, who was entirely unapologetic. I was really impressed. An aircrew member not working this flight, but who was planning to hop a ride on the plane, explained to me (sounding about as impressed by the practice as I was) that Air Canada flights are always booked to about 110% capacity. They assuming not everyone will show (I know people miss flights now and then, but seriously?). As it turned out, there was an open seat in the cockpit, so aircrew-guy took that seat and gave me his. I rode home in the center seat at the very back of the plane with nothing but the open isle in front of me. Good times. Still, better than getting home a day later. My thanks go out to aircrew-guy. WestJet on the other hand, though I cannot be sure they don't do the same overbooking thing, has never screwed me in this way, or lost my luggage on a direct flight (thanks again Air Canada). This could be just luck, but they also provide a complimentary alcoholic beverage. Air Canada does not. Guess who I like better. Perhaps there are some useful aspects to the pre-flight safety demonstration for first time flyers. You don't come across those little, yellow oxygen masks just anywhere (assuming you don't watch much television either). But the seat belt? Really, who is unfamiliar with a seat belt? Even though the aircraft version may differ slightly from the one in a standard car, the basic functionality is the same. But all bases must be covered. Maybe there is someone travelling, for the first time, from a tiny, remote island where cars are yet to make an appearance (they rode a donkey to the airport I imagine). For this hypothetical individual, we must all sit through the reminder flight, after flight...after flight. Before the safety brief began, the flight attendants came around for the customary 'stowed luggage/trays and seats up/seat belts fastened/ear buds out' check (do you see the flaw yet?). And I was thinking, surly the hypothetical island native is not on this flight direct from Ottawa to Toronto, can I please just listen to my music now? Lo and behold, she was sitting next to me! The woman beside me had not figured out her seat belt. Joke's on me...and the flight attendant, who calmly explained which strap went where while almost managing not to betray her surprise. In the passenger's defense, once the straps were sorted, she did manage to buckle herself. (disclaimer: I cannot say for certain that this woman is from a tiny, remote island without cars, but I'll hazard a guess that she is not a frequent flyer). The seat checks were completed and the attendant took up her place to carry out the safety brief. 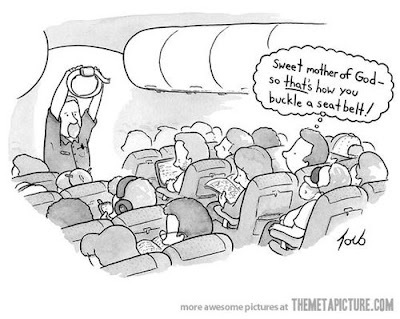 Pamphlets out, exits vaguely pointed to, oxygen masks explained, seat-belt demonstration...see the flaw now? I could only chuckle as it occurred to me that not only was this the gazillionth such demonstration for most passengers, it was being done AFTER everyone had been checked and buckled in. Shouldn't the demonstration--if we must be subjected to it--at least come first? Then perhaps my seatmate could have sorted herself out without extra assistance. Yeah, of course rather than posting I should be novel writing, this is one of those 'but I'm still being productive' types of procrastination.